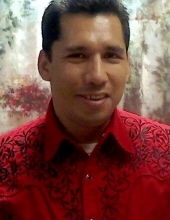 William, or as he would prefer, Lewis, was born on July 28, 1968 and passed peacefully on January 24, 2019 in Pasadena, TX. He is survived by his parents David and Betty Valencia, his brother Rudy (Spouse Sonia) Fernandez, sisters Andrea (Spouse Esteban) Fernandez-Sorto, Jessica (Spouse Jesus) Rojas, and Alice (Spouse Ascari) May. He is preceded in death by his sister Mary Jane Valencia. He is also survived by five nieces, six nephews, and 6 great nieces and nephews. will produce much fruit. For apart from me you can do nothing. are my true disciples. This brings great glory to my Father. We are very grateful to the Garcia family for showing their love, support, and dedication to Lewis and for being a part of his life. They were a blessing to our loved one. Thank you for treating Lewis as if he was part of your own family. To send flowers or a remembrance gift to the family of William Lewis Fernandez, please visit our Tribute Store. "Email Address" would like to share the life celebration of William Lewis Fernandez. Click on the "link" to go to share a favorite memory or leave a condolence message for the family.